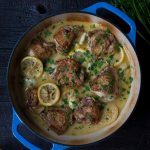 These Crispy Baked Chicken Thighs with Lemon and Garlic are juicy and tender on the inside and crisp on the outside. They’re easy to prepare with only a few simple ingredients, making this baked chicken thigh recipe a fabulous dinner for any night! Dark meat always has more flavor. I’ve read several articles about bone-in meat, and some insist that bones add flavor while others claim it’s a myth. Serious Eats ran tests and concluded that the bone helps the meat stay more tender, but that they don’t impact the flavor. I’ve never tested it myself, but either way, bones have a positive impact on the final results. I do know for a fact that leaving the skin absolutely makes a difference. You get juiciness from the fat, and the seasoned, crispy skin tastes awesome. So how do you get perfect crispy baked chicken thighs? Make sure to thoroughly pat the chicken skin dry before seasoning and searing. You can’t achieve crispy chicken without the skin. Do not remove it. Use a pan such as cast iron, stainless steel or aluminum (anything but nonstick). Cast iron really does get the best sear. Make sure the pan is hot and is coated with a layer of fat (but isn’t smoking). The other option, if you’re worried about the skin burning, is to start the chicken in a cold pan and allow both to heat up together. I haven’t tried this, but America’s Test Kitchen recommends it, and I trust them. Use a thin, firm spatula to flip the chicken. I recommend a fish spatula. If the chicken is sticking, don’t touch it. It will eventually loosen up. Don’t crowd the pan or it will impact the temperature. The chicken should not be touching. Cook in batches if necessary. Use a splatter screen to avoid getting grease all over your stove (or your hands and arms). Wait to add herbs and garlic until after you’ve finished searing and lowered the heat. They’ll burn and taste bitter. If you want crispy skin without the bones, you can debone the thighs before cooking. In my experience, boneless skin-on thighs are nearly impossible to find, so you need to do it yourself. For more info on deboning (and to get an awesome recipe), check out Nom Nom Paleo’s Cracklin’ Chicken. Some websites suggest tempering your meat before searing or grilling, which means letting it come to room temperature first. Serious Eats tested this theory, and found it made absolutely no difference, so I wouldn’t bother. Use a meat thermometer to make sure that the internal temperature reads 165 degrees F before removing the chicken from the oven. Whether you’re roasting or browning in a pan, always season the skin very well with salt and pepper before cooking. The seasoning will adhere better to the raw skin and the final results will taste better. Add slightly more than you think you need. If you’re also interested in recipes that use boneless skinless chicken thighs, you’ll love my Pesto Pasta with Chicken! Still hungry? Other dinner recipes you should check out include my Cheesy Spinach and Artichoke Pasta, Teriyaki Salmon, and Cincinnati Chili. 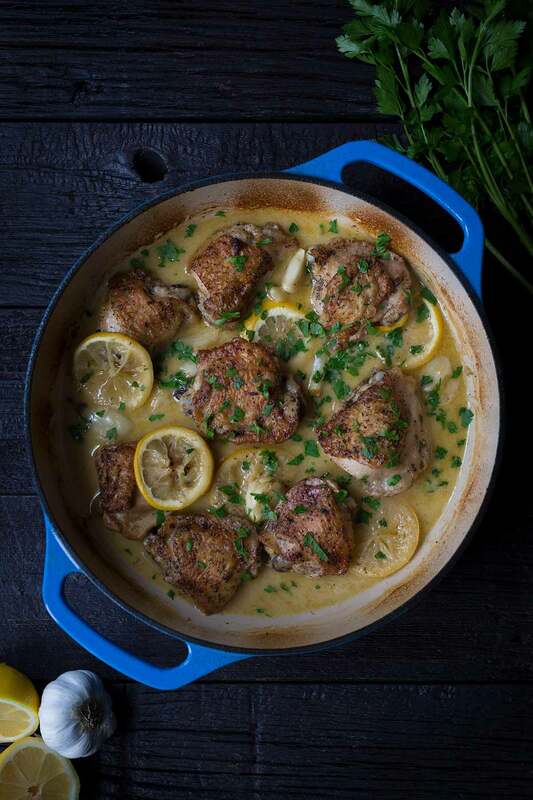 These Crispy Baked Chicken Thighs with Lemon and Garlic are juicy and tender on the inside and crispy on the outside. Slice one lemon into thin slices, discarding the ends, and set aside. Juice the remaining lemon until you have approximately 2 tablespoons of juice. Add the juice to a blender (you could also use a jar with a tight fitting lid). Mince 2 cloves of garlic and add to the blender. Lightly smash the remaining 6 cloves and set them aside with the lemon slices. Add the olive oil and chicken stock to the blender, along with 1/4 teaspoon each of salt and pepper. Briefly puree. Season the chicken thighs well with salt and pepper (this adds a ton of flavor to the skin). Place a large cast iron or stainless steel skillet over medium/medium-high heat, and add the clarified butter. You might need slightly more or less butter depending on the diameter of your pan; mine is 12 inches. Once the butter is hot and shimmery, add the chicken thighs to the pan, skin-side down, leaving some space so they’re not touching (cook in batches if necessary). Cover with a splatter screen if you have one. Sear the skin for approximately 5-7 minutes without moving it. Turn the heat down or briefly move the pan off the burner if you feel like it may burn, but do not attempt to flip the chicken too soon or the skin will stick to the pan. Once the skin is brown and crispy, use a spatula to flip the chicken and then cook for an additional 2-3 minutes. Carefully remove from the pan and set aside, skin-side up (just for a moment). Turn off the heat. Turn the blender back on briefly on to re-emulsify and froth up the liquid. Pour some of it into the hot pan and use the spatula to scrape up any brown, caramelized bits, incorporating them into the liquid. The pan will still be hot and sizzling, so be careful. Add the chicken back to the pan, skin-side up. Pour the sauce into the pan from the side, taking care to avoid pouring it over the chicken (keep that skin crispy!). Fill in any gaps with the reserved garlic and lemon slices. Place the pan in the oven, uncovered, and cook until the internal temperature of the chicken reaches 165 degrees F, approximately 10-15 minutes. Before serving, drizzle chicken with some of the pan sauce and top with chopped fresh parsley. A Dutch oven would also work for this recipe. The goal is to use a piece of equipment that’s nonstick, a good conductor of heat, and that offers enough surface space for the chicken thighs. Check out my post for additional tips on how to get the perfect sear on chicken thighs. Can’t beat a chicken thigh dinner! This looks so comforting! This seriously puts my dinner to shame tonight! I thought stainless steel was NOT non-stick, but you list it as an example of a nonstick surface. I am confused. Eggs certainly adhere to stainless steel like glue. THANK YOU, Carrie. You know, I proofread 10x AND have a second person proofread, and we still both missed that I wrote the exact opposite of what I was trying to say. Judging by all of the well-versed cooks who have already commented, I’m guessing they glossed over that as well since I listed 3 “stick” surfaces immediately after. I’m glad someone caught that so quickly. I owe you cookies. These look amazing- definitely making soon!! Crispy chicken thighs and lemon and garlic very good with lots of tasty sauce…not dry at all. Also made the chicken curry twice. Excellent. 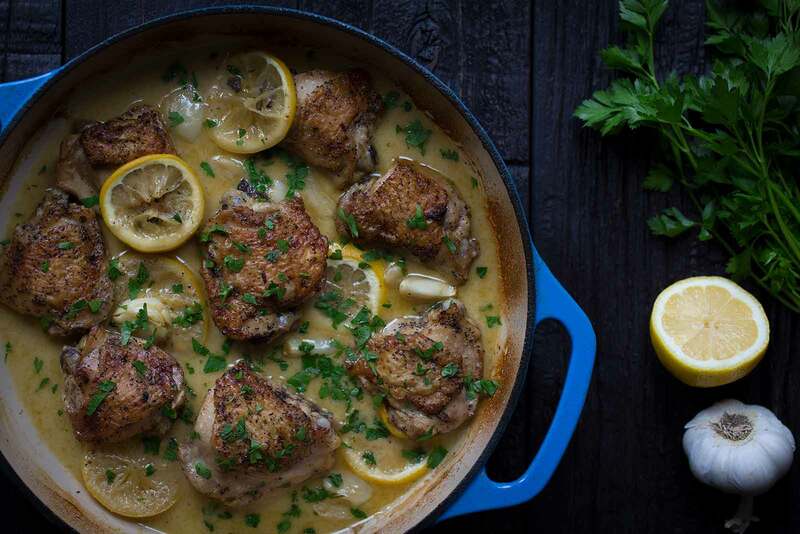 Garlic and lemon do so much to enhance chicken! These baked thighs are the perfect example—so delicious! I love finding new and delicious chicken thigh recipes! 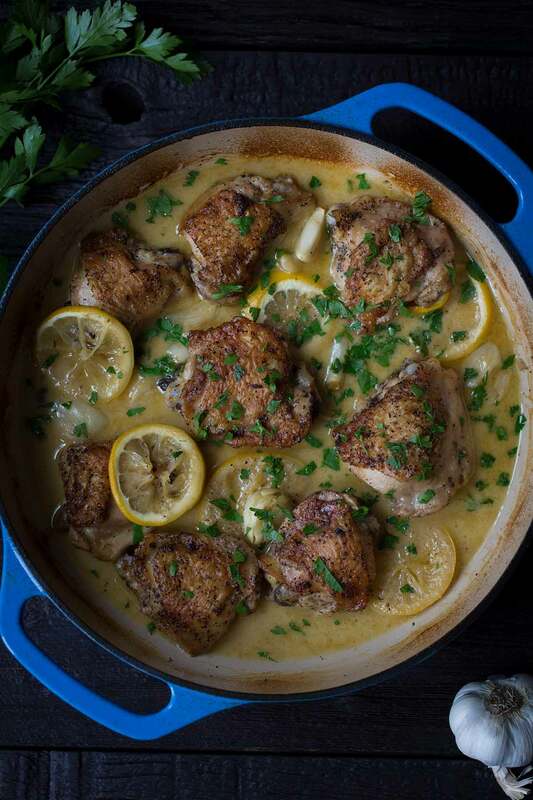 Love the lemon and garlic flavors you used for these baked chicken thighs! So delicious! Great tips for getting that crispiness on the chicken thighs! I love your tips on baking chicken perfectly. It clearly worked with this recipe! This is S U P E R. Thank you, Jennifer! Chicken Thighs are the best, they always stay juicy. And the lemon garlic here is perfect!